On Monday, if things go as planned, the woman who accused Supreme Court nominee Judge Brett Kavanaugh of sexual assault will testify before the Senate Judiciary Committee. Alt-left domestic terrorists are now defacing statues of revered Catholic saints. The war on statues spread to Catholic saints this weekend while a judge in Georgia lost his job because he criticized the monument vandals. 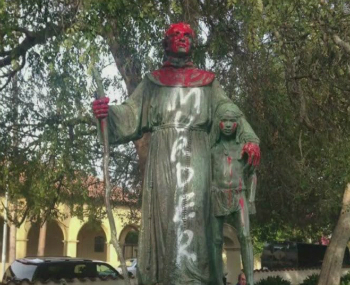 Vandals spray-painted a statue of Junipero Serra at a Los Angeles park across the street from Mission San Fernando on Thursday. A photo of the vandalized statue has gone viral. Happy Mother’s Day to all the mothers, grandmothers, stepmothers, godmothers, foster mothers, mothers-in-law, grandmothers-in-law, and honorary mothers in our reading audience. That includes greats, great-grands, and greats of any other degree! There’s a need to share and expound on this lunacy. Pope Francis put his shoulder to the doors of the Catholic Church and shoved them open a little wider Friday, calling for the church to be more tolerant in practice while not changing any official doctrines.